The Colombian latex waist cincher is constructed from high-quality premium latex material which offers incredible durability and an extraordinary flexibility. This cincher is constructed in Colombia, a region known for producing some of the best waist cinchers drawing on traditional as well as modern designs. This cincher is constructed in a flexible design so that it is very comfortable to wear. At the same time, the flexible design of the cincher also corrects your posture along natural lines. The semi-flexible structure also ensures that the cincher will not roll up when you sit down, keeping it in a good position as long as you are wearing it. The Colombian cincher is meant to be used on a daily basis. And it is available in a wide variety of sizes so that you are able to find the one that exactly suits your size and body type. The cincher has a design featuring three vertical rows of hooks. These hooks can be manipulated to adjust the size of the cincher and to tighten it for additional pressure whenever the need be. The pressure exerted by this cincher essentially creates a Sauna effect in the abdominal area and raises the body temperature. As a result, the body sweats and the fat deposits in the area are significantly reduced. An additional feature of this cincher is that its inner layer is designed to absorb the sweat produced by the body so that you won’t feel uncomfortable while wearing it. A slight downside of latex material is that it can be somewhat odorous for 2 to 3 days after unpacking. To tackle this, simply put the latex cincher in a well-ventilated area following unpacking. This will take care of the typical latex odor within 3 days and you can then wear the cincher. The design of this cincher is elegant which allows you to wear it as a part of your regular dress or as an undergarment. The Colombian cincher is strong enough to be used as a Boned Waist Training Corset as well. 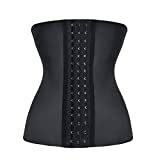 So if you are into waist training as well, this cincher offers a dual advantage.